I have seen in many places and have heard from friends that every year one of their New Year’s resolutions is or was to get organized. Why do I say it “is or was”? Because many people believe they have failed already. Getting organized is not a transformation that happens in the blink of an eye. It takes time and dedication. In this case what I would suggest is to start slowly and don’t get overwhelmed. Tackle one small project at a time. You could start with a 10/15 minute per day or even per week task. Think about organizing as a new routine at the gym after a long time away. You need to start slow so that you keep going and don’t give up. You don’t need to have expensive organizational tools to get the work done. Re-purpose bins, baskets, drawers organizers from other parts of the house that are not working very well to get a project accomplished. I’ve found out that trying a new organization system for a couple of days is the best way to make sure that system I am using is really helpful for my lifestyle. To give you an idea of what to organize in 10/15 minutes, I would say one drawer (like the one in the picture). 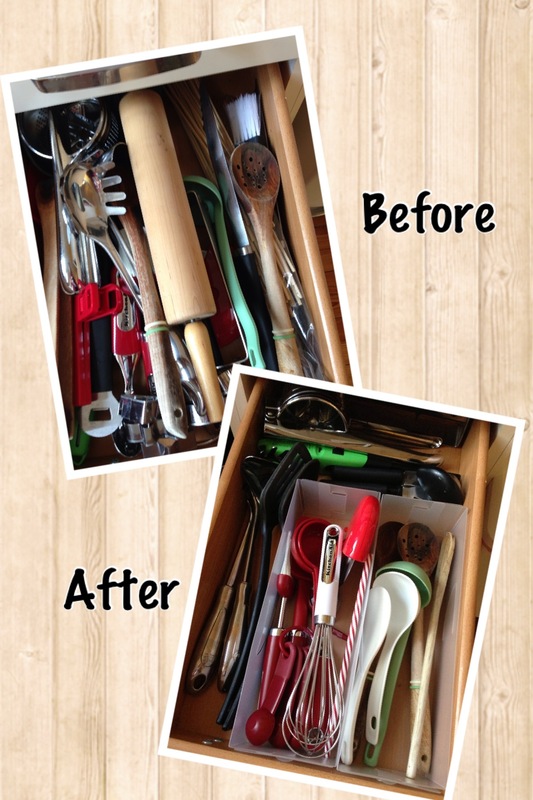 I did a junk kitchen drawer, the one where everyone just dumps the kitchen utensils in it, and organized it with bureau dividers (that are used to organize wardrobes). The utensils that are used most of the time now live in a container on the counter. It is easier to access them when cooking. What will organize this week? I would love to know about your projects. Previous The time has arrived!